Tornadoes touched down in the upper Midwest and northern Arkansas, killing at least three people, as a spring-like storm system posed a risk to 45 million people. 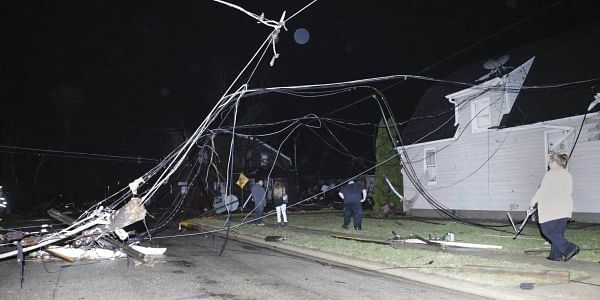 LITTLE ROCK: A spring-like storm system that killed at least three people as it spawned tornadoes and damaged dozens of homes in the central U.S. rumbled eastward Wednesday, putting about 95 million people in its path, forecasters said. The compact but strong storms, known as supercells, raked parts of Arkansas, Iowa, Indiana, Illinois, Ohio, Kentucky and Tennessee on Tuesday and Wednesday. Meanwhile, wind-whipped wildfires destroyed homes in Texas. Forecasters with the Storm Prediction Center said severe thunderstorms that could spawn tornadoes were expected in parts of Kentucky and Tennessee on Wednesday morning before moving into mid-Atlantic states and southern New England. New York, Philadelphia, Baltimore, Atlanta and Washington, D.C. could also be affected. The storm system killed at least two people in Illinois and one in Missouri. In Arkansas, emergency managers said 10 to 15 people were injured in White County, about 45 miles northeast of Little Rock, and minor injuries were reported at a prison in the northeastern part of the state. In Illinois, state Emergency Management Agency spokeswoman Patti Thompson said a person was killed by a tree that was uprooted by a tornado in Ottawa, about 70 miles southwest of Chicago. Minor injuries were also reported at a nursing home there. Thompson said it wasn't known how many people were hurt by the storm, but that it was relatively few. "We had some damage reported in several counties, both in the north-central part of the state as well as the southern part of the state," Thompson said. Another person was killed when a tornado ripped through Perry County, Missouri, about 80 miles south of St. Louis. Eight to 10 homes near the small town of Perryville were badly damaged and winds were so strong that several vehicles were blown off of Interstate 55. Hundreds of people, including many schoolchildren, took shelter at Bald Knob High School in Arkansas after a tornado warning was posted for the area. Emergency managers said Wednesday that the storm damaged 40 homes in the county. The Storm Prediction Center had warned that some of Tuesday's storms would track over long distances. The Arkansas storm held together for more than 100 miles, though it did not produce tornadoes.